China's National People's Congress has set the country's growth target for 2016 at a lower range of 6.5%-7%. The congress is also expected to approve a new five-year plan, a legacy of the communist command economy. 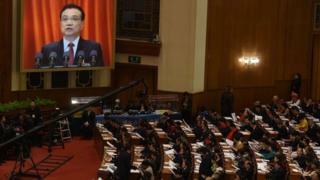 Mr Li also said that China was targeting consumer inflation at "around 3%" and unemployment "within 4.5%". Image caption Heading off to new jobs in the service industry?